When I turned eleven years old, my dad took me out for lunch to celebrate. I still remember what I ate: a perfect filet mignon, a baked potato, and for dessert, something I had never tried: chocolate torte. It was my first encounter with a “flourless” chocolate cake. I can say for sure that it was one of the best birthday presents I ever got. From that day forward, for me, a rich chocolate dessert has been pretty much a compulsory part of any celebration. In my book, chocolate is a nearly perfect way to communicate affection, congratulations and love. I had always loved regular chocolate cake, but this treat took things to a whole other level with its rich velvety interior and deep chocolate finish. In the years that followed, I’ve enjoyed some sort of chocolate cake for nearly every birthday and countless other occasions. Over the years, I developed a preference for chocolate cake that came to the table warm, mostly because it made such a nice surface for gently melting a scoop of ice cream or a dollop of whipped cream. Sometimes, though, it’s nice to be able to whip up a little something in your own kitchen. Something that is both soothing and fancy. Something a little bit special. I find that my strongest cravings often arrive at exactly the same time as my desire to leave the house plummets, and Valentine’s Day tends to be one of those times. If the snow isn’t falling in buckets, the restaurants are sure to be full to capacity. While I love the notion of sharing fond feelings with my Valentine, waiting hours for a table or risking life and limb to go out simply don’t appeal. 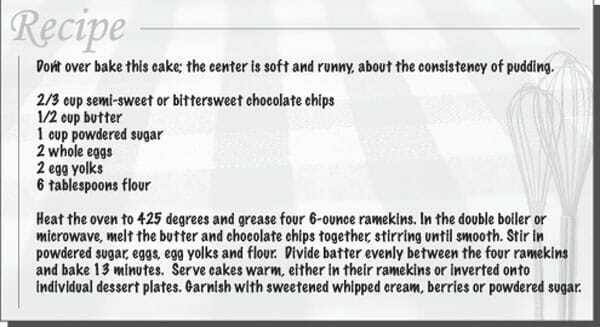 A few years back, I stumbled onto a recipe for a cake that is “molten” in the center. It fits my criteria for chocolate cake perfection in that it’s rich and tasty, is best eaten warm, and because the center is soft, it’s supposed to fall a bit in the middle. With some trepidation, I gave it a shot, and about a half an hour later, happily served a homemade version of my favorite restaurant dessert. I’ve now tweaked the recipe just a bit and successfully made it several times. The recipe makes four cakes, each in its own six-ounce ramekin. For Valentine’s Day, I like to place a small paper heart in the center of the cake when it comes out of the oven, sprinkle it with powdered sugar and then remove the heart for a festive presentation. Other times, I invert the cake onto a small plate and dress it up with whipped cream. No matter how you serve it, though, this dessert says I love you.